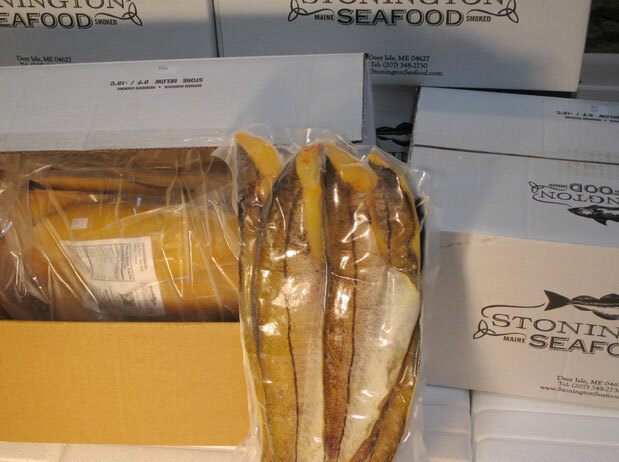 Stonington Seafood’s Finnan Haddie is available for wholesale frozen in 15-lb cases. A food service product format is packed in five variable weight, 3-lb average, vacuum packs of uncut sides. Alternatively, it can be ordered with fifteen 16-oz vacuum packs or twenty 12-oz retail vacuum packs. All wholesale products are sealed inside the corrugated case in a zip-lock bag to prevent frosting and provide additional ease of handling and storage convenience for our wholesale customers. 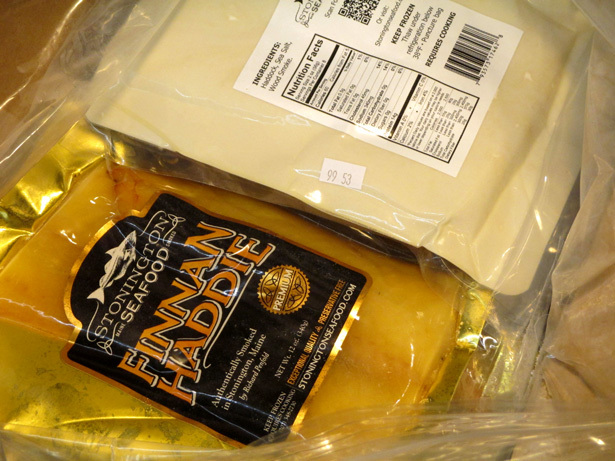 Individual Finnan Haddie packs come with nutrition facts, UPC code, and a QR code link to Stonington’s Finnan Haddie recipes. Heavy weight retail vacuum bags are microwaveable and have a top hole punched for hanging. It is recommended that the retail packs be displayed and sold frozen. 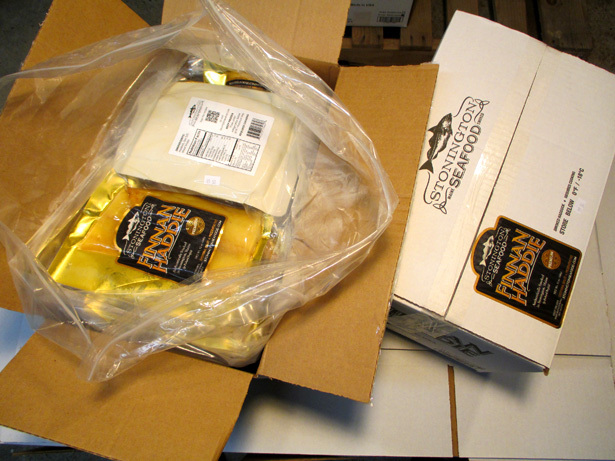 Stonington’s Finnan Haddie is portioned, packed and blast frozen within hours of being smoked. When thawed refrigerated, it has its full shelf life of 14 days. The haddock used to prepare Stonington Seafood’s wholesale product is FAS long-line caught Norwegian, from responsible fisheries that are in the process of gaining Marine Stewardship Council Certification. Small batches of H&G are thawed chem-free to order, and then ‘J’cut by hand in Portland by Nova Seafood. This results in minimal frozen-storage periods prior to order fulfillment, and the flexibility to fill orders with consistent quality all-year-round. The haddock used is of a slightly smaller size-grade than the extra-large specialty Icelandic product sold on this web site. However, the texture, light salt content, and delicate flavor make it a dependable and premium product. 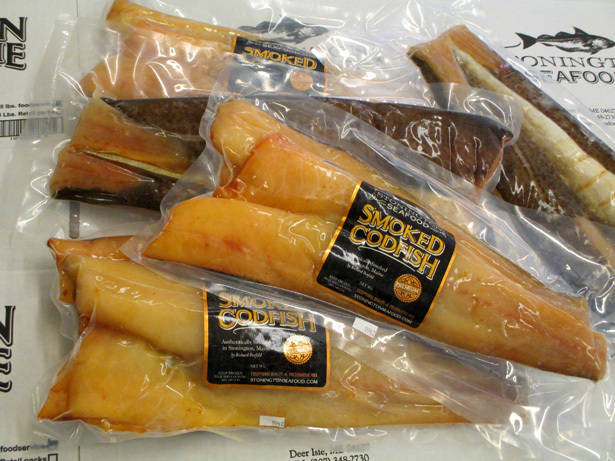 In addition to smoked haddock, Stonington Seafood has added a premium line of smoked Atlantic cod sides suitable for food service. Also available in a 16-oz pack. For a lower price point, and to take advantage of the exceptional quality fresh Atlantic pollock available from Portland’s Fish Exchange, Stonington Seafood is one of the few smoking companies that has developed the ability to brine and smoke Atlantic Pollock without the product being over salty. This product is smoked to order and available by request. 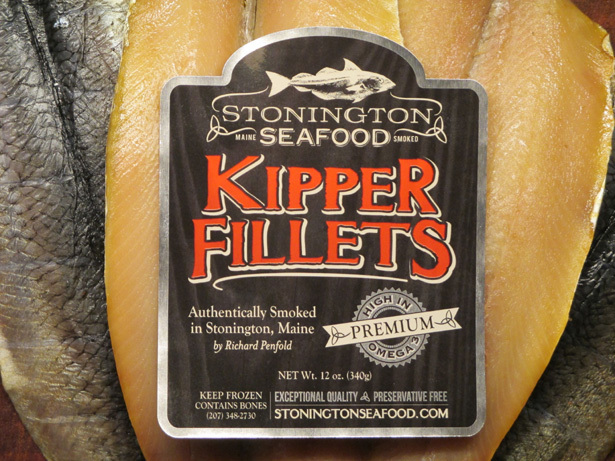 In 2014 Stonington Seafood added a line of quality fatty kipper fillets, responding to a demand for a premium product that is smoked to order in small batches. Specialty herring are secured from traditional fatty herring fishing grounds off Newfoundland for an exceptional product. The same raw material, ( imported from Halifax NS) was used by Shetland Smoke masters in the 1980’s, and exported by Ice Atlantic Seafood as Shetland kippers to World markets including Australia and South Africa. Early in 2015 Stonington Seafood plans to add a line of exceptional quality hot smoked mackerel using select large whole fatty mackerel sourced from the same historic Newfoundland fishing grounds. These individually select mackerel are of a larger size grade than used by other smokehouses resulting in a delicately sweet and buttery texture. 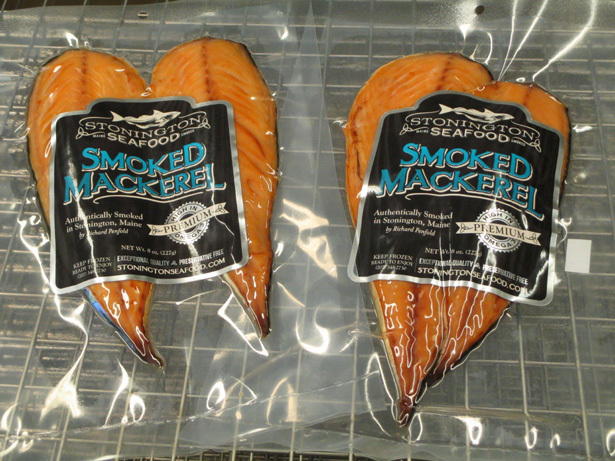 Stonington Seafood’s hot smoked mackerel will be available as an 8-oz retail pack or for food service. Richard will return your call to discuss pricing and distribution.